BAseball Reality Tour: No Pressure, Starlin! Is it fair to compare 20-year old Starlin Castro with 36-year old, 5-time World Champion, future Hall of Famer, Derek Jeter? 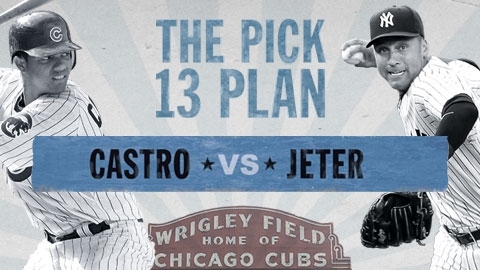 Well, Jeeze, um, I guess we'll pick, um... Castro? It's quite likely that we will not see another player reach Jeter's level of fan and media adoration or respect in our lifetimes. Cal Ripken, Jr played his first Major League game more than forty years after Lou Gehrig passed away, and he's the closest we've had to anyone being compared to the Iron Horse. Way back in 1995, Ripken broke Gehrig's 'unbreakable' record, but many people still put Gehrig on a higher pedestal. Jeter's likely going to be at the Ripken level, when he's done. More than a majority of his peers, who played under the shadow of the Selig Era, Derek Jeter will be seen as a link to the great players of a simpler time, pre-Selig. Jeter will be remembered up there with all time greats like Ripken, Tony Gwynn, and George Brett. I don't feel the Cubs' marketing arm should be chastised for this bit of creative. It's just that it made me cringe a bit. As a fan of baseball history who repeatedly makes himself the victim of unattainable expectations, this ticket sales ad struck a nerve. Surprisingly enough, there are some similarities, and an argument can be made. Entering their 20-year old seasons, both players were ranked by Baseball America as the 16th best prospects in all of baseball. It's pretty cool that Castro had just 2 fewer extra base hits in 148 fewer plate appearances. Unfortunately, it is a weak argument, and it ends the way any Cubs argument could have ended over the last century... the Cubs didn't win the Championship. Maybe the Cubs just need Castro to be 22-years old. Could 2012 be the year that the Cubs stop the madness? 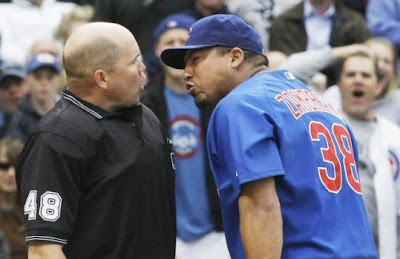 Losing patience, Zambrano? You've only been at it for 10 years.